Tired of city life? how about taking a vacation to a countryside village? A place with fresh air, fresh water and many beautiful landscapes. Luckily, Europe is home to some of the most picturesque villages in the world. The followings are 10 most beautiful villages in Europe. Bosa is a small, picturesque seaside town located on a small hill in the Northwest coast of Sardinia city in Italy. It is built around an impressive medieval castle called ‘Castello Malaspina’. Temo River, the only navigable river in Sardinia city also rung through Bosa town. This magical small town is also famed for its heritage, culture and architectural beauty. The vivid, multicolored houses in the backdrop of the Malaspina castle in the town are truly a breathtaking scene. At Sa Costa district, in the historic center of Bosa town you can see amazing medieval streets and stone staircases. You can also find amenities like cafes, restaurants and bars at the historic center of the town. 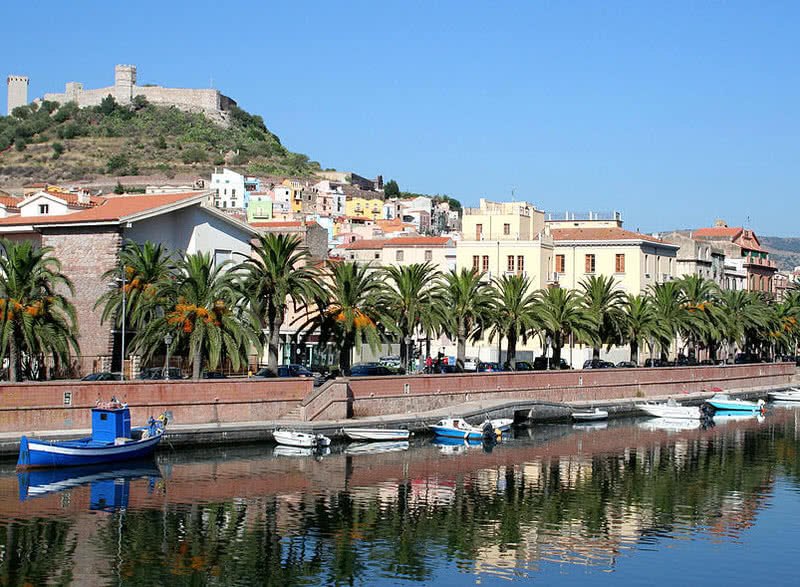 From the hilltop Malaspina castle you can enjoy the beauty of the Bosa town at its best. Apart from the architectural beauty Bosa is also a peaceful city. The local are so friendly. There is also a numerous beaches near the town. The Bosa Marina is the nearest and cleanest beach near Bosa town. The architectural beauty, cultural and historical value of the Bosa town also attracts the visitors from around the world. Cochem is a traditional German town located in the beautiful Moselle river valley in the Southwestern part of the country. This small town is a great holiday destination that can offer many fascinating things to discover. Cochem is famed for its stunning river valley, picturesque vineyards and half-timbered houses. 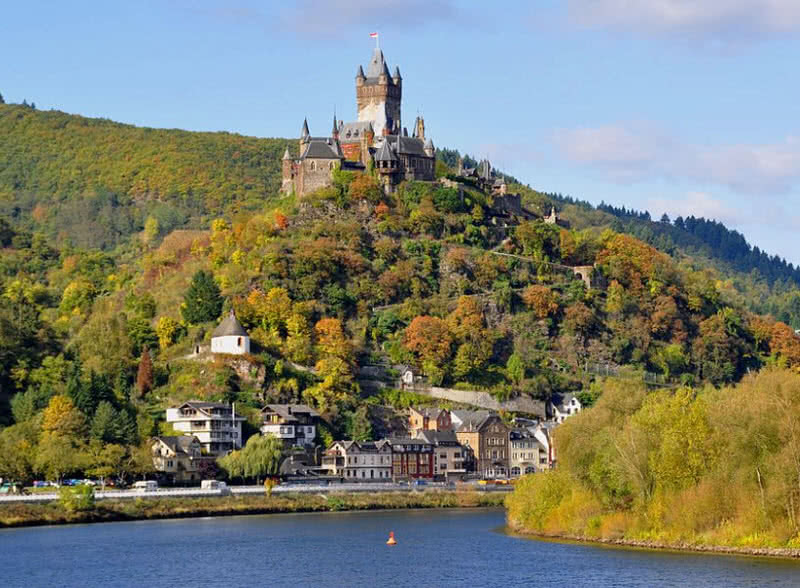 The Cochem hilltop castle overlooking the river valley stands as an icon of the town. The view of the Cochem valley from the castle is just incredible. In addition to all these attractions the Cochem city has a pleasant mild climate. Cycling is the best way to explore the beauty of this town. One ride along the beautiful river valleys and vineyards of Cochem town can be a great experience for you. 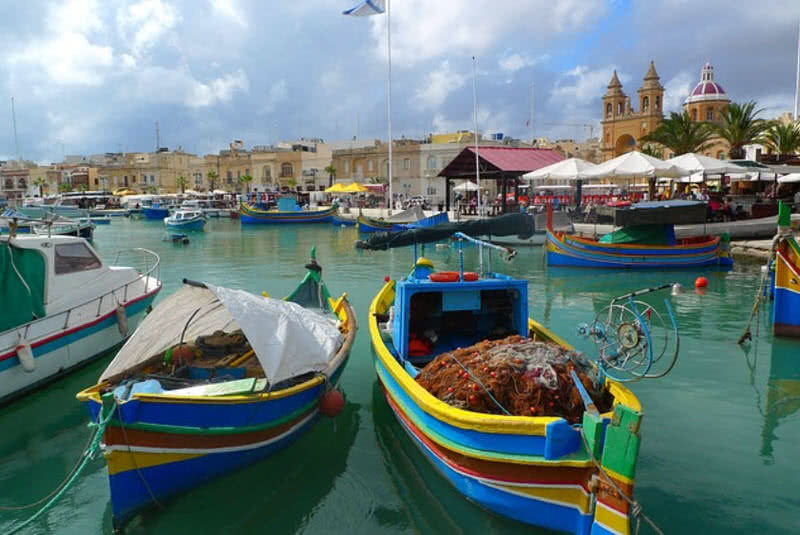 Marsaxlokk is a traditional fishing village located in the Southeastern part of Malta. This village is famed for its fishing market and colorful boats bobbing on its harbor. These boats are named as ‘Luzzus’ and have great significance in the day to day life of the village. They also have a long history. The locals have been used Luzzus since 800 B.C. You can see mythical eyes of Osiris painted on each Luzzus. Locals believed that the painted eyes of God can protect their boats from the evil. Marsaxlokk is also a historically important village. The Tag-Silg hill of Marsaxlokk contain the remains of a megalithic temple. Many Bronze Age tools have been also found from this hill. On all Sundays the Marsaxlokk fish market gets crowded. As Marsaxlokk a nice fishing village you can enjoy delicious seafood there. This village has a number of good restaurants and cafes. Murren is a stunning mountain village located at an altitude of 5413 ft, in the Bernese Oberland in Switzerland. It is the highest inhabited village in Canton of the Bern city. 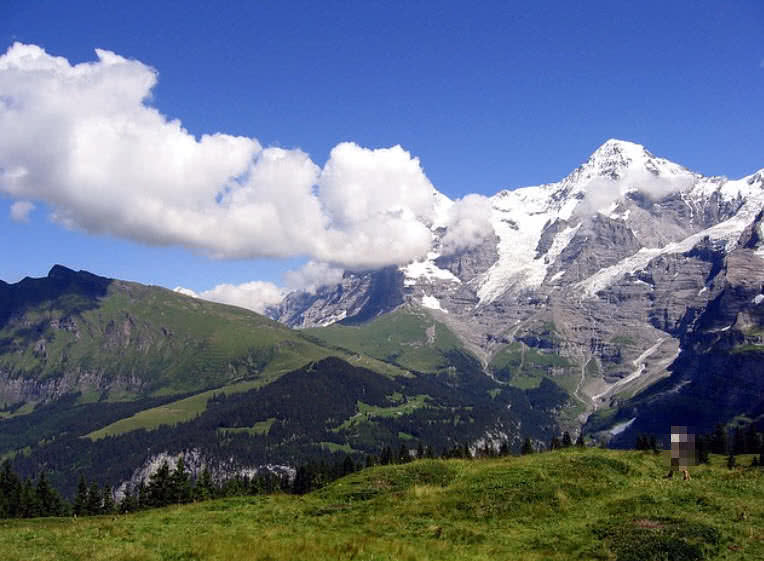 From this mountain village you can enjoy the beautiful three famous Alpine peaks – Monch, Eiger and Jungfrau. This village is famed for its unrivalled scenery and an ideal destination for base jumpers. Murren is a car free village. You can get cable car service from the Lauterbrunnen valley (located at the base of Murren village) to access this mountain village. Even in such a high altitude location you can find services like bank, post office, fire station, emergency center, school, tourist office, cafes, holiday apartments and restaurants. Almost all beautiful buildings in Murren village constructed using wood. The chalet style hotels in this village also have a unique look. Apart from the breathtaking view of Alpine peaks and landscapes there are also 200 km long walking trails in the village. Gasadalur is a tiny village located in the Mykines Island in the Faroe archipelago. Situated at the edge of a tall cliff and surrounded by top peaks of Mykines islands Gasadalur is definitely one of the beautiful villages on Earth. Because of remoteness, this village only has a population of 18. Even though the settlement of the village in the unique location overlooking the sea is just breathtaking. Until the opening of the tunnel to the village in 2004, the resident of Gasadalur had to hike 200 meter high mountain to reach their houses. Today the 4.9 km long tunnel makes it easier to access the village and also open the door to tourism. 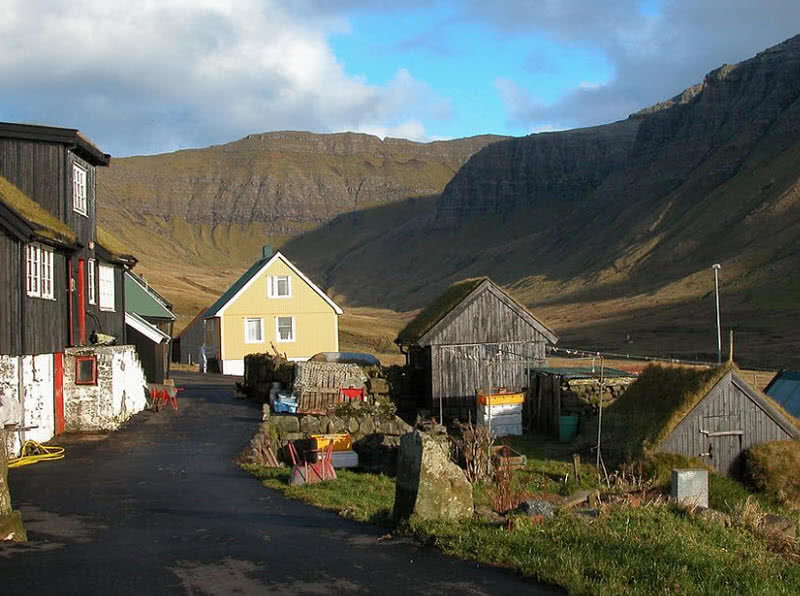 Unsurprisingly the income of the income of the inhabitants of Gasadalur predominantly relies on fishing. The unique settlement of the village also attracts the tourists from around the world. Giethoorn is a pretty, peaceful village located in Overijssel province of the Netherlands. It is a car free village. Instead of roads you can find beautiful canals in this village. Just like in Venice the lands of Giethoorn are linked together by around 150 bridges. As this village has so much similarities with Venice it has been nicknamed as The Venice of Netherlands. The Giethoorn village is so peaceful and greenish. Unlike the crowded cities you can enjoy a profound silence in this village. It is completely free from noisy cars. You can get around this beautiful village by foot, bicycle or a canoe. Giethoorn has 98 km long canoe trails. The electric boats available for hire in this village are also free from noise. It is environmental friendly and nicknamed as ‘whisper boasts’. 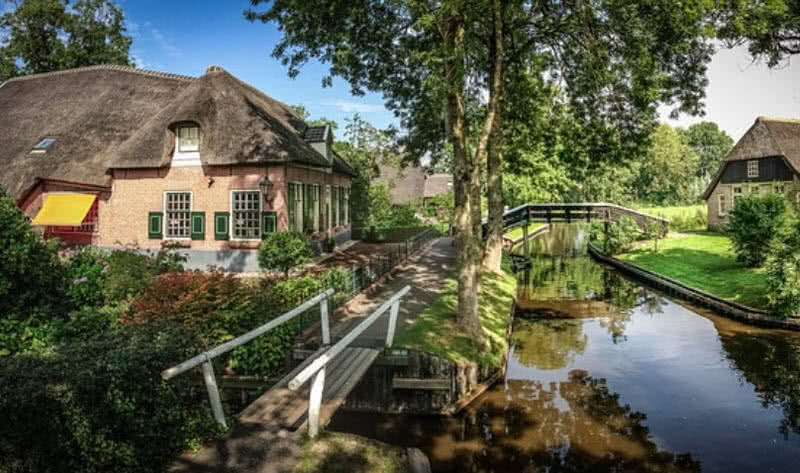 Giethoorn is also one of the greenest places in the Netherlands. It is surrounded by vast De Weerribben-Wieden National park and home to many trees. So the atmosphere in the Giethoorn village is also very clean like its surroundings. Bibury is a charming village located on the bank of the river Coln in Gloucestershire County in England. Once famous English designer William Morris described Bibury as ‘The most beautiful village in England’. The 17th century stone cottages and beautiful Coln river flow through the village are the main attractions in Bibury. It is also the most photographed villages in England. The stone cottages in this village is known as Arlington row cottages. These cottages were originally built back in the 13th century as a monastic wool store. In the 17th century, this wool store converted into Weaver’s cottages. The Bibury trout farm founded back in 1902 is another major attraction in the village. The farm protects a numerous swans, kingfishers, ducks and geese. Every year around 10 million of rainbow trout also spawned in this farm. 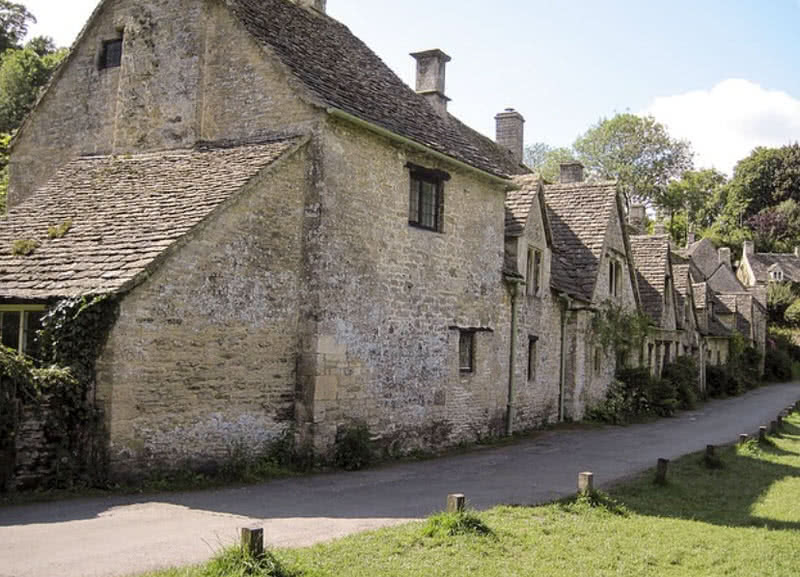 In addition to all these attractions the Bibury village has a peaceful and calm atmosphere. Freudenberg is a pretty, medieval town situated in the German province of Rhine-Westphalia. This small town covers only an area of 93 square kilometers. 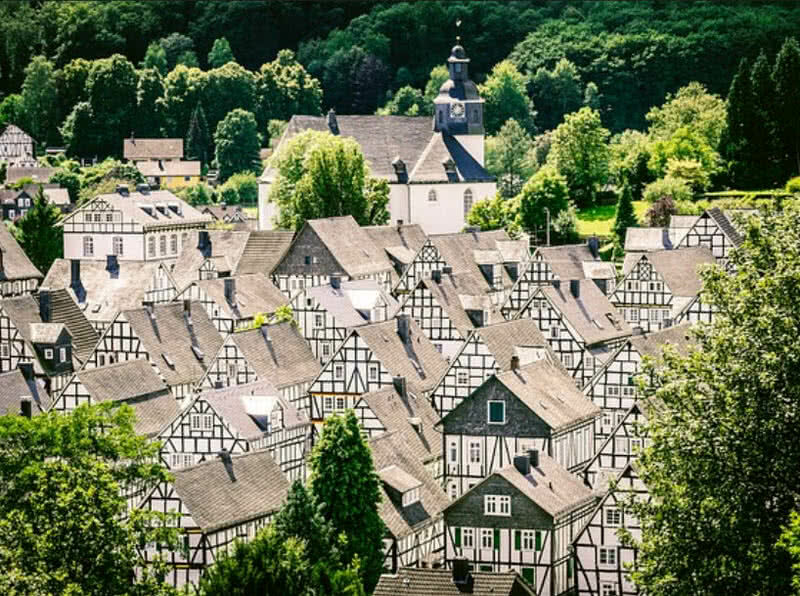 It can be called as most beautiful small town in Germany. Because the setting of wooden houses in the scenic landscape in the city will definitely leave you speechless. Surprisingly, almost all houses in the town have the same size and pattern. The clean and well-maintained streets of Freudenberg make it easy to explore the city by foot. The air quality in this town is just outstanding. Alter Fleken is the most important and oldest part of the town. The majority of houses in the town is concentrated in this area. In addition to the great setting of the houses you can also enjoy beautiful landscapes and delicious foods of Freudenberg. Situated between scenic Lake Hallstatt and towering Dachstein mountains Hallstatt is a spectacular Alpine village that worth visiting. This unbelievably beautiful lakeside village is one of the most photographed locations in Austria. Apart from the beautiful settlement this village has great historical significance. Hallstatt has one of oldest salt mines in the world. The salt deposits in the village have found as early as the 2nd century B.C. The museum in the Hallstatt village is also home to 7000 years old artifacts. Considering the historical importance and architectural beauty UNESCO has been recognized the Alpine region of Hallstatt-Dachstein as a world heritage site in 1997. You can feel a very calm atmosphere as you walk around the Hallstatt. This village is free from noise of vehicles. The streets in the village are narrow and clean. Almost all houses in Hallstatt made of wood and look amazing. The village has many interesting sights to offer. Boat riding in Lake Hallstatte is a main tourist activity in the village. The view of Hallstatt from the lake is also an amazing sight. 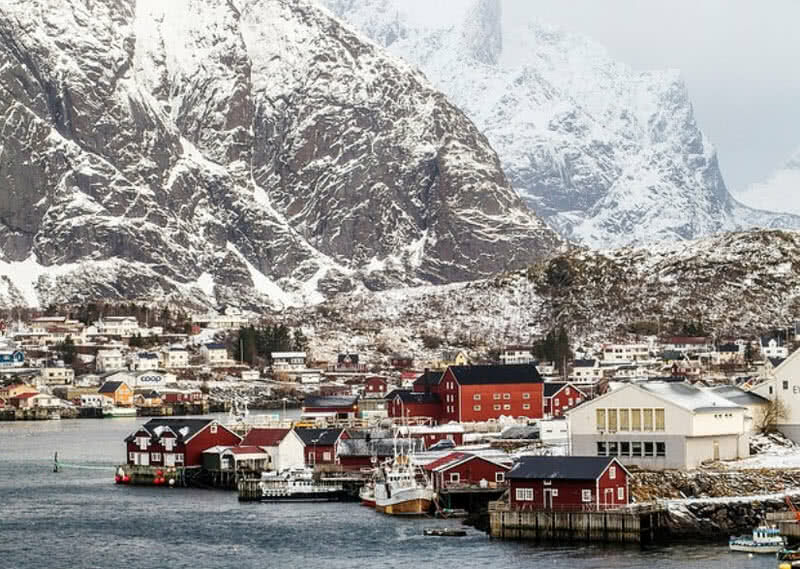 Nestled between dramatic cliffs and blue-watered bays the Norwegian fishing village of Reine truly deserve the title of ‘The most beautiful village’ in the world. It is located in the Lofoten islands in county of Norland. 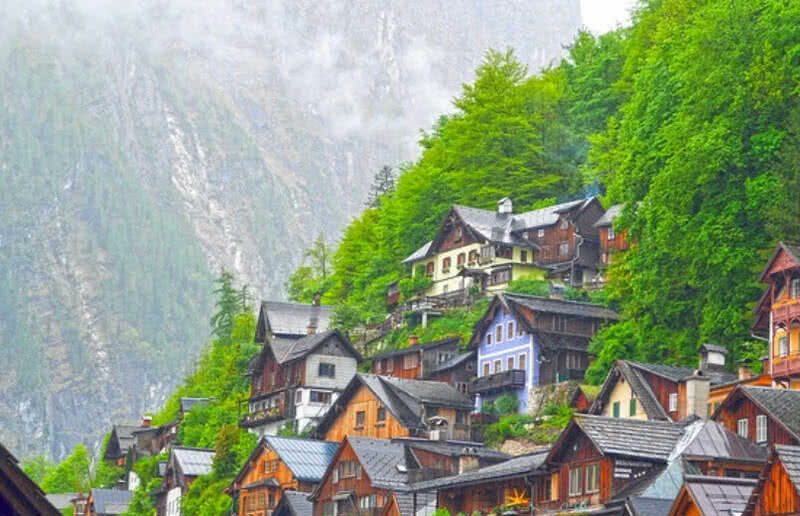 For tourists, this village looks like a magical land. In the backdrop of majestic Reinefjorden the setting of colorful fishermen’s huts on the shoreline is just an unbelievably beautiful scene. Reine is also a calm and quiet village. The population of this village is just 300. But the unique location and the breathtakingly beautiful landscape made it as one of the major tourist destinations in the Lofoten islands. There are plenty of things to enjoy in Reine village. Some of the best hikes in Lofoten islands are very near to Reine village. As this village located in the Arctic Circle you can enjoy the jaw-dropping light show of Northern lights. Biking, kayaking, whale watching and bird spotting are other popular tourist activities in Reine village.